STORY: While the world is battling the consequences of climate change and exploring options of renewable energy sources, a little village in northern India is setting an example of being completely powered by solar energy. Mandirowali Bhuddi village in Amroha district of Uttar Pradesh state is located near a sharp cut of giant Ganges River. The tricky terrain had made it difficult for the government to take electric poles to the village, so they decided to turn to solar energy. The sight of solar panels installed on every hut made of mud and straw, hosting buffaloes in their courtyards, make for an uncharacteristic sight. However, this has definitely made life easier for the residents of the small village. “It’s a big change. Now our children can study at home as well,” said a villager Khichdu Singh who owns a sweet shop. India and France laid foundation for an International Solar Alliance with more than 122 countries in 2016. 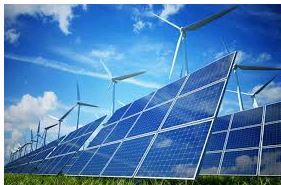 The country has been focusing on solar energy for more than eight years and aims to acquire solar power manufacturing capacity of 100 gigawatt by 2022 with an investment of $100 billion.